When Mayor Bill de Blasio first proposed the idea for a streetcar connecting the waterfront neighborhoods along Queens and Brooklyn, many were skeptical. How would it be funded? Would it cause more traffic and congestion? Why not just add a new bus line? Enter the Friends of the Brooklyn-Queens Connector (BQX), a nonprofit group that first developed the idea. Now, it’s tasked with selling the plan to the people. 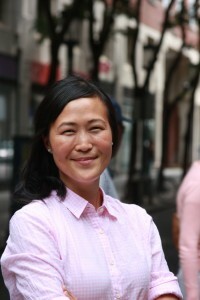 Friends of the BQX is led by Ya-Ting Liu, a veteran in transit and environmental advocacy. In a sit-down interview recently with It’s Queens, Liu spoke about the challenges of selling what would be the city’s first new rail system since the subway began serving customers more than a century ago. One of the main arguments for the creation of this emissions-free, battery-powered streetcar is the increasing number of residents and workers who no longer need to step foot in Manhattan. According to data from Friends of the BQX, 400,000 people live in the ten waterfront neighborhoods and 300,000 people work along the corridor today. To keep up with the economic and population growth, there needs to be better infrastructure between the two boroughs, proponents argue. They project an annual ridership of 15.8 million by 2035 and 52,000 people daily. The project still has many details left unresolved. The city hasn’t established what route the proposed streetcar would take, such as if it will run down 21st Street in Queens or closer to the waterfront. Although the BQX aims for fare integration with the MTA, meaning a single Metrocard swipe can get a rider on both the subway and streetcar, it’s not a done deal yet. Liu said she understands the skepticism, which is often based on people’s lived experiences. That’s where the Friends group is stepping in. Made up of representatives from educational institutions, civic and neighborhood groups, cultural sites, business organizations and real estate firms, Friends of BQX is striving to reflect the diversity of the corridor, Liu said. She described the group’s role as educating and engaging the public about this “unprecedented public transit project” and build support for it.